As you probably recall, Waldo Williams, one of the poets we read, was from Haverfordwest, Pembrokeshire, both of which are names that show up on the Haverford and Bryn Mawr campuses, respectively. Knowing this, I decided to look into the origins of some of the Welsh place names in the area. I found this website about the “Welsh Mainline” (welshmainline.blogspot.com/), which talks about some nearby towns and their origins. 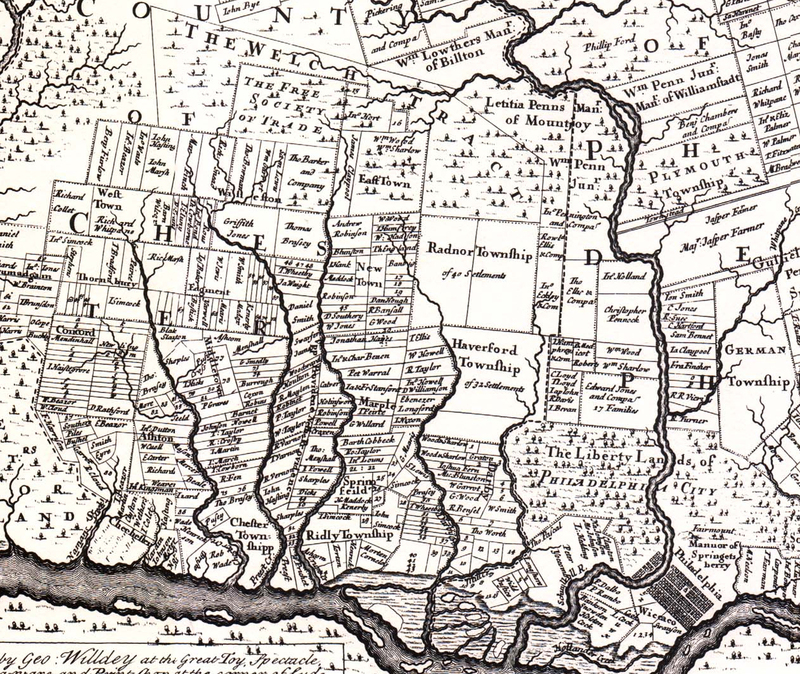 Welsh Quakers settled 40,000 acres west of Philadelphia (Delaware, Montgomery and Chester counties). In 1684, they tried to get William Penn to agree to make it a separate county, where government business would be conducted in Welsh, since few of them spoke English. However, their request was unheeded, as the land was divided between different English counties. When the Pennsylvania Railroad put in the Mainline in the 1800’s, many non-Welsh place names were changed by the railroad in order to give the area more of a unified history and make it more marketable. Following are some local Welsh names and their origins. Haverford means “goat crossing” in Welsh. As we discussed in class, it was named for the Welsh town Haverfordwest. It was settled in 1681 by Welsh Quakers. Bryn Mawr was originally Humphreysville, but was renamed by the Pennsylvania Railroad in 1869. However, its Welsh name does have significance (unlike some other towns’ later Welsh names which are just nonsense). It means “big hill” and is named after an estate in North Wales, the farm of Rowland Ellis, a settler who came to Pennsylvania in 1686 fleeing religious persecution. Brecon was given its current name in 1981, since it was dedicated by a Lady Brecon. Brecon is the name of the county where the town Bryn Mawr is found in Wales. Radnor (the township, not the dorm) is named after Radnorshire, Wales. It was founded in 1682 on land from William Penn, and the town grew up around a meetinghouse built by the Welsh settlers in 1718, which is the same meetinghouse that stands there today. Many of the Welsh settlers left to avoid high taxes in the late 1700’s. Supposedly, there are monuments honoring their founding of the town; however, I was unable to find information on exactly what these are. Saint David’s is named after a local Saint David’s church built in the 1700’s. Saint David is the patron saint of Wales. Paoli is not a Welsh name, but is actually named after the Corsican general Pasquale Paoli. The center of the town was an inn, built in 1769, and run by a Joshua Evans, whose father had bought the land from William Penn. Evans named his inn Paoli, because the general was given the last toast in a Saint Patrick’s Day celebration at the inn. Gladwynne is good example of an example of a settlement (although not a census-designated place) that was renamed to fit in with the other Welsh names in the area. It was originally “Merion Square,” which presumably came from Meirionnydd County in Wales. However, this name was apparently not Welsh enough for the casual listener, as it was renamed to Gladwynne in 1891. “Gladwynne” sounds Welsh but doesn’t actually mean anything. I’ve been playing the pennywhistle for a number of years, and I started teaching one of my housemates to play this semester, so I decided to do some research on the origins of this instrument, which is common in Irish folk music. The modern pennywhistle is typically made up of a brass tube with six holes and a plastic mouthpiece, although it can be all metal or all plastic, as well. It plays only two major scales. The most common whistle plays in the keys of D and G. It is known as a D whistle, because the lowest note is a D. There are also whistles made in other pitches, such as A, G, C, or a lower D. However, most traditional Irish music is in the keys of D and G, so these are not frequently played. Robin Williamson’s The Pennywhistle Book tells us that “the whistle was first used in magic rituals; forbidden by the Medieval Church as being irresistible to women, it gave birth in later years to the flageolet and recorder…But the humble pennywhistle has proved immune to changing fashions”. However, my research reveals that the pennywhistle, whose ancestors probably originated in China around 5,000 years ago and appeared in the Celtic world around the 1200’s, comes from the six-holed, wooden flageolet. In the late 1700’s, the flageolet began to be produced from tin plate, which was cheaper than wood and hence more accessible to a greater number of people. This new instrument had a wooden or lead plug at the end of the tube to create a mouthpiece. Supposedly, one could buy it for a penny, which is where the name came from. At this point, the tube of the whistle was wider at the top and became narrower at the end. In the 1950’s, the plastic mouthpiece was invented, and this allowed the metal tube to be straight, as it is in most whistles today. Some modern whistles, such as the Clarke brand, are still made with a tapered tube and a wooden plug at the top for a mouthpiece. If reading this post has inspired you to learn to play the pennywhistle, I would suggest buying a standard D whistle of the Oak brand, which costs about $10. There are several cheap brands of whistles, but in my opinion Oak whistles have the best sound. Now you can sing your homework, instead of just reading it. I thought that I would write my first post on the Battlefield Band, a Scottish folk group whose music I enjoy. As somebody who likes to listen to both traditional folk songs and fiddle tunes, as well as music written by new songwriters, I like the Battlefield Band because they play both original compositions and traditional music. Those of you who have read the Robert Burns post below might be interested to know that they have also composed tunes to some Robert Burns poems. The Battlefield Band was foundedin 1969 in Battlefield, outside Glasgow, although the lineup of musicians has changed since then. Currently, it includes Sean O’Donnell (voice/guitar), Ewen Henderson (fiddle/bagpipes/whistles/piano/voice), Alasdair White (fiddle/whistle/bazouki/highland and small pipes), and Mike Katz (highland and small pipes/whistles/bass guitar/guitar). When I saw them in the United States in 2009 and 2010, the last original member of the band, Alan Reid, was still with them, and Henderson had not yet joined. A third song on the album I thought would be worth mentioning is “The Emigrant”, a traditional song told from the perspective of an Irish emigrant to the United States who gained his citizenship but lost his leg fighting for the union in the Civil War. Unfortunately, I was unable to find a youtube link for that one. “Be at a hush, boys. Take my advice. To America I’ll have yous not be coming. The album also contains many instrumental tracks, both traditional and contemporary. I was unable to find full recordings of many of the tracks, but you can check the album out on itunes.